I’m sure I’ve previously mentioned that I adore movies about old Hollywood. The glamour, the scandals- I can’t get enough. This week I’ll be watching Scorsese’s The Aviator (DVD/Download), one of the best films to feature re-imagined classic film stars. Cate Blanchett as Katherine Hepburn; Gwen Stefani as Jean Harlow; Kate Beckinsale as Ava Gardner- the list goes on and on. And yes, there is Leonardo DiCaprio as mogul Howard Hughes, but who are we kidding here- the ladies are the stars of this show. The Aviator follows Howard Hughes’ career as a movie producer and aviation pioneer, his success overshadowed by a raging case of OCD. Hughes’ money and charm attract a cavalcade of beautiful starlets, but it’s Hepburn who really connects with him. I know, I know, she was meant to be with Spencer Tracy, but a part of me wanted her to end up with Howard Hughes. Cate Blanchett does Hepburn like nobody’s business, completely nailing the WASP-y New England accent and athletic stride. I was less impressed by Kate Beckinsale’s breathy portrayal of Ava Gardner, though of course I loved her costumes! Really though, the best part for me is the fabulous wallpaper in the bathroom of the Beverly Hills Hotel. That iconic giant palm-leaf design is a welcome distraction from DiCaprio’s sweaty overacting mess below it. The 1930’s must have been an amazing time to be in Hollywood. Not just for the films (though those were good too), but also for the cocktails! Imagine sipping a gin cocktail at the Cocoanut Grove, a drunken Errol Flynn at the next table over, hitting on starlets left and right. Paying tribute to classic drinks and Hughes’ obsession with flying, while watching The Aviator I recommend drinking an Aviation cocktail. Add all ingredients to a shaker filled with ice, shake until chilled, then strain into a coupe glass. Garnish with a maraschino cherry (optional). Obviously, The Aviator focuses a great deal on Hughes’ aviation experience (including one harrowing plane crash over Beverly Hills), but it’s also a love letter to cinema. Watching the filming of Hell’s Angels is pure fun, and I love seeing how the coloration and technology of cinema changes over time. In short, come for the glitz and action, but continue watching for the style and history. Cheers! Posted in Dramas and tagged Aviator cocktail, Cate Blanchett, classic film stars, Gwen Stefani, Howard Hughes, Jude Law, Kate Beckinsale, Leonardo DiCaprio, Martin Scorsese, movie cocktails, The Aviator. Bookmark the permalink. After a very late night spent watching The Oscars on Sunday, I admit I had a tough time getting up the next morning. The only thing that got me out of bed was the promise of seeing a recap of last-night’s dresses all over the internet. I admit that I did pretty darn well in my office Oscar pool, though of course there were some definite sure things on the ballot this year. One of those sure things was Cate Blanchett, who very deservedly won her Best Actress statuette for Blue Jasmine. In celebration of her victory as well as her unfailingly good fashion sense, I’m watching the wonderful film for which she was honored. Blue Jasmine (DVD/Download) tells the story of a wealthy New York socialite whose cheating, embezzling husband commits suicide while in prison for his financial crimes. Broke and lost, Jasmine seeks refuge at her sister Ginger’s apartment in San Francisco. Throughout the film, we discover that Jasmine’s seemingly perfect former life with her husband (played by Alec Baldwin) was decidedly imperfect. Jasmine manages to torpedo her own life as well as everyone else’s around her, resulting in a well-dressed shell of a woman who talks to herself and drinks Stoli martinis like they’re going out of style. Written and directed by Woody Allen, this film is very reminiscent of A Streetcar Named Desire. Bobby Cannavale is definitely no Marlon Brando, but Blanchette is a fabulous stand-in for Vivien Leigh. For anyone watching this movie, you’ll notice that Jasmine drinks an awful lot of vodka. Specifically, her drink of choice is a Stoli martini. It’s a classic, but a classic for a reason. I’ve always preferred a twist of lemon over an olive in a martini because I think the tart lemon flavor complements the vodka much better than what is essentially a ball of salt at the bottom of the glass. 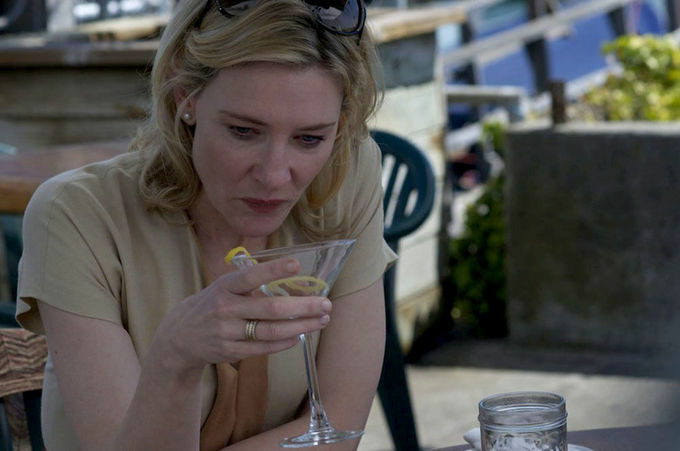 When watching Blue Jasmine, you really can’t drink anything but a Stoli Martini with a Twist of Lemon. 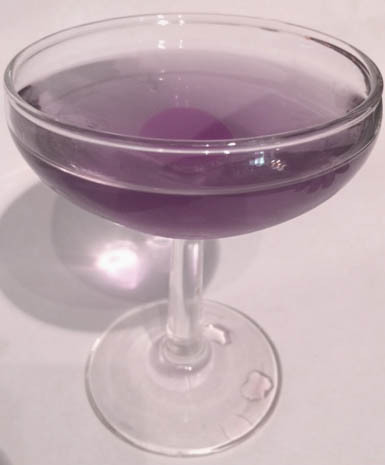 Pour a small amount of vermouth into a martini glass and swirl it around, just so it coats the sides. Pour out excess. Add vodka into a shaker with ice, and gently stir until chilled (or shake it if you’re a James Bond fan). Pour vodka into prepared glass, and top with lemon twist. The first time I saw Blue Jasmine, I knew it would be an instant classic. It’s a story that’s timeless, but yet so current. Jasmine is a woman who is unraveling, and it’s riveting to watch it happen. Whether she can be redeemed in the end, we’ll never know. I hope so. But for tonight, raise a glass to the great Cate Blanchette, and be glad that the Oscars only happen once a year (otherwise I might need to borrow a Xanex from Jasmine to manage my excitement). Cheers! Posted in Dramas and tagged Alec Baldwin, Blue Jasmine, Bobby Cannavale, Cate Blanchett, Sally Hawkins, Stoli Martini recipe, Woody Allen. Bookmark the permalink. It’s finally here!!!!! My favorite night of the year, the night where beautiful and talented stars line up on the red carpet, answer inane questions from Giuliana Rancic, and pretend to lose gracefully when their name is not called up to the podium. That’s right- it’s the Oscars! I’m actually pretty excited about tonight’s line-up because there aren’t a lot of sure bets this year. Okay, I admit, Jared Leto and Cate Blanchett are probably shoo-ins, but when it comes to the Best Picture category, it’s anybody’s guess. I have high hopes that I triumphed in my office Oscar pool, but this year it was pretty tough to guess the winners. Thus I will be sitting on the edge of my seat with all of you Cinema Sips readers, waiting to see if Gravity takes it all, or American Hustle manages some surprise wins. One thing that I do know for certain however, is that there is bound to be some AMAZING fashion tonight. With nominees like Lupita Nyong’o and Cate Blanchett, the red carpet is going to be quite the show. I have high hopes that Jennifer Lawrence will triumph over her electrical tape-bedsheet Golden Globes disaster, and my husband has high hopes that he’ll get to see more of Amy Adams’ sternum tonight. Will Jared Leto leave his Jesus-locks down or pull them into a chic up-do? How many jokes will be made at the expense of model-izer Leonardo DiCaprio? These are questions I am dying to find answers to. My drink tonight is fairly simple because I know we’re going to be far too busy dissecting outfits to bother with complicated drink recipes. Tonight, I’m planning to get dressed up in my Oscar-finest (aka- an old bridesmaid dress), hit up In-N-Out burger like the real celebrities do, and fix myself a Red Carpet cocktail. 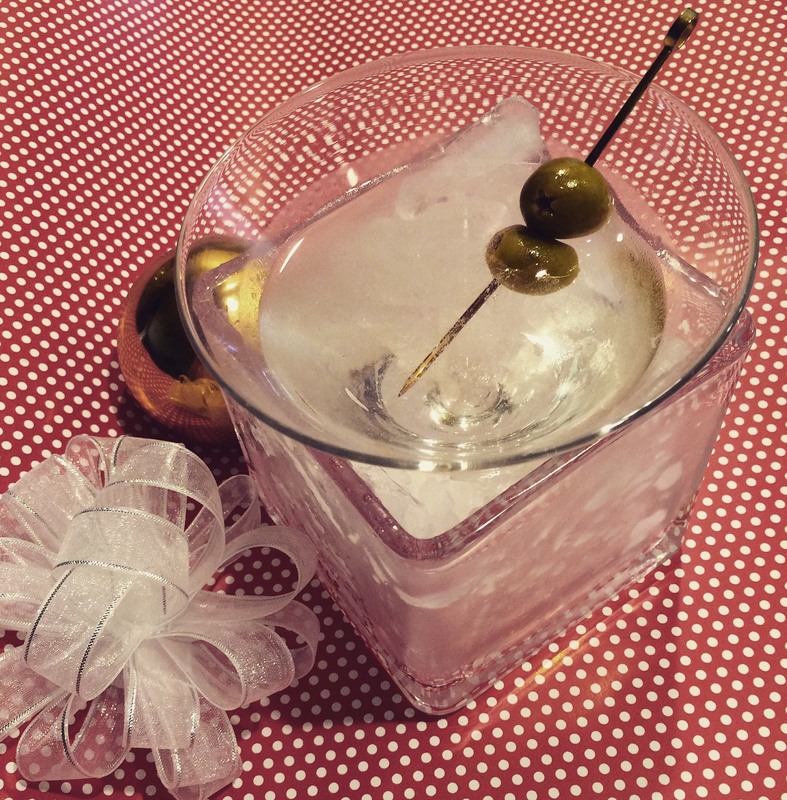 Pour chilled champagne into glass, top with St. Germain, and garnish with Maraschino Cherry. Enjoy this fizzy drink while you laugh at Ellen Degeneres’ jokes (though who are we kidding- she’s no Tina Fey/Amy Poehler) and wince as the E! hosts subject stars to the Glam Cam 360. This is Hollywood’s biggest night, and I for one plan to celebrate a great year in cinema. Cheers! Posted in Uncategorized and tagged Amy Adams, Cate Blanchett, E! red carpet, Ellen Degeneres, Giuliana Rancic, Jared Leto, Leonardo DiCaprio, Lupita Nyong'o, Oscar cocktail, Red Carpet cocktail. Bookmark the permalink.